The revival of 3D was partly driven by the new can do technology. The accuracy and repeatability of digital recording and image processing made it possible to produce good on-screen stereo 3D. However, it was generally accepted that the lack of suitable glasses-free 3D screens killed it for the TV consumer market, and most people have now turned their back on it. However 3D movies continue to be made, albeit in small numbers. Cinema audiences can accept wearing glasses and do sit down and concentrate on the screen unlike most home TV viewers. Recently, my investment in an IMAX seat to experience Gravity in 3D proved to be worth every penny. Now I know exactly what its like to be in space! 4K is not a revival but something brand new to television, although cinema has been using something very similar for a while. Recently NAB Executive Vice President of Conventions and Business Operations Chris Brown said, At the 2013 NAB Show, 4K was the most widely-covered and talked-about technology trend of the show. I expect 2014 to be no different. So it is no surprise that Insight Media and NAB Show have partnered to produce a 4K Zone in the North Hall. Thats a good idea but I notice the booth areas available are 10x10 and 6x6 feet. Punters had better rush for the larger plots as the 6x6 foot ones wont have enough wall length to hang a 84-inch screen! Part of the reason for the 4K excitement is that TV screens are now beginning to sell in significant numbers, as prices tumble. For example, just one supplier, China Star Optoelectronics Technology (CSOT), shipped 100,000 in October alone. In the USA Variety reports that the Consumer Electronic Associations economist and director of research, Shawn G. DuBravac has said that 60,000 4K TVs were sold last year, and that 500,000 are expected to sell this year. Although the number looks big, it is not so much when measured against the countrys total annual set sales of around 40 million. CEA reckons global 4K TV sales will be around 2.5 million this year. It appears that we, the broadcast TV industry, are not alone. Interest in 4K is widening as visitors to the recent ISE (Integrated Systems Europe) exhibition at the Amsterdam RAI found out. Reports say that 4K was everywhere a major feature at the show. But this exhibition is not about broadcast television! It seems that other media systems, in particular digital signage, are taking a big interest in the new eye-catching format. The broadcast trade news is full of 4K stories, some about new productions but largely driven by industry manufacturers introducing new equipment to support the format. 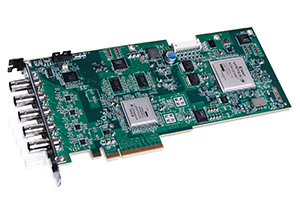 MatroxVideo has announced the immediate availability of 10-bit H.264 intra-frame rendering with the Matrox Mojito 4K quad 3G-SDI 4K video monitoring card. This is for use with Adobe Premiere Pro CCon Windows platforms. The card is reported to enable realtime monitoring and output of video footage at resolutions up to 4096 x 2160, and frame rates to 60 fps. AJA Video Systems has announced availability of Io 4K. This is billed as an evolution of its professional video I/O devices, updated and customised for Thunderbolt 2 technology and the latest 4K workflows. Io 4K connects to any Thunderbolt 2-enabled device, such as the new Mac Pro, and offers an additional Thunderbolt 2 port for daisy-chaining other peripherals in supported workflows. Of course there has been a whole lot of 4K going on at Sochi; with all that action and huge light levels it is a great opportunity to create chip-loads of pristine eye-catching footage. Besides the Russian broadcasts by NTV+, Panasonic has recorded the opening ceremony in 4K with the cooperation of the International Olympic Committee and Olympic Broadcasting Services. The company states that This footage will be used as the companys own video production materials. This is good news as sadly there has been a boring familiarity of the footage Ive already seen at Currys! Hopefully Panasonic will be able to capture more video of the events at Sochi, and so provide fresh footage for demo material. So is 4K now bigger than 3D TV? Looking at the recent and up-coming trade shows it is clear that there is increasing momentum for 4K, with no signs of fading. This is increasingly beginning supported by commercial reality with the sales of screens taking off and 4K becoming a preferred format for shooting big events though, as reported last month, only the final of the World Cup Soccer will be shot in the format. 4K needs greater support with much more programme material to watch; it is currently suffering from the usual chicken-and-egg syndrome. 4K is easy to watch and rewards those who get up close to the screen with a wealth of picture detail. As for 3D, it continues in cinemas and will not disappear, but it is unlikely to be doing much with TV as, ultimately, it is not easy to watch in the way we watch TV today.